A night of raising funds for the three charities. Dress to the theme to avoid 'fined'. Enjoy great music and company. Spot prizes and giveaways. Kathy will be walking 1000 kilometers from Harare to Gonerazhou National Park. ALL the funds raised will be shared between these 3 credible and dedicated organizations. 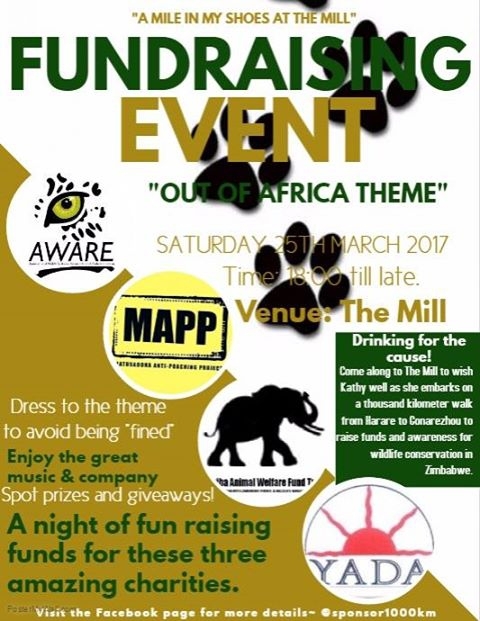 Please help me to make this evening at The Mill Bar & Grill on the 25th March 2017 a night to remember. This is the week prior to Kathy's departure and we want to give her a positive send off, as only Zimbabweans can.Help me share this message far and wide and lets get a crowd behind this amazing journey and this amazing woman. (+263 777) 550 603 to discuss. For all those proud Zimbo's living overseas we need your help to. Please get in touch to see how you can support Kathy from abroad. With Zim the way it is we need your support more than ever.